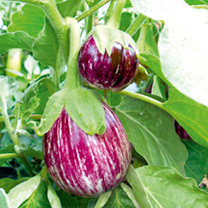 Originating in south east Asia aubergines were once regarded as being unusual but aubergine seeds are surprisingly easy to grow. As a semi-tropical plant aubergine seeds really need to be started and grown under glass although they will do well outside in a warm sunny garden. When sown under glass aubergine seeds are as easy to grow as their relative the tomato. 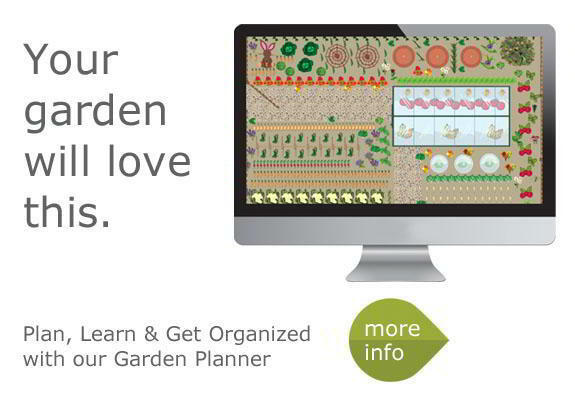 When to sow aubergine seeds? How to sow aubergine seeds? 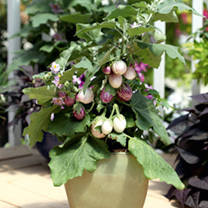 Simply sow 2 aubergine seeds in each small pot using good quality multi-purpose compost. Keep under glass at 60-70°. Once germination has taken place, in 14-21 days, carefully remove the weaker seedling. When the seedlings are 12.5 to 15cm high transplant them to larger pots or plant 3 to a growing bag. When the stem is about 30cm high carefully pinch out the growing tip. 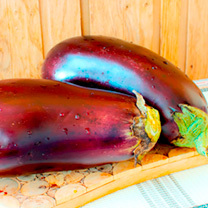 Aubergine Seeds once grown into fruit contain both vitamins E and K and are rich in potassium. 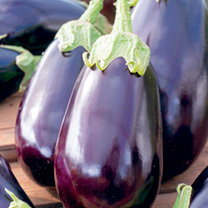 Aubergines are easily prepared for cooking and are a key ingredient of popular dishes such as ratatouille and moussaka. How do I care for my grafted aubergine plants? Check the plants are moist when they arrive and grow on in 10cm (2.5") pots using a good quality potting compost. When planting ensure that the graft is well above soil level to prevent the scion rooting into the soil which would reduce resistance to soil borne diseases. Maintain a temperature of 16-18 °C (60-65 °F) and provide a cane support. Once the roots fill the pot, transfer into 30cm (12") pots or plant in the greenhouse border 60cm (2ft) apart. 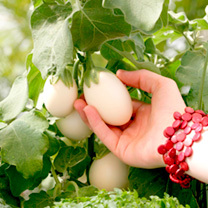 (These plants are not suitable for growing in growbags due to the strong root system). Grafted peppers and aubergines are vigorous plants and as the fruits start to set, start feeding twice a week using a liquid tomato fertilizer, damping down the pathways on hot sunny days to increase humidity. Misting the plants with water will aid fruit setting. The plants can be grown on a sunny patio once the danger of frost has passed in early June but the best results will be obtained when grown in the greenhouse. Can I grow aubergine's in pots?